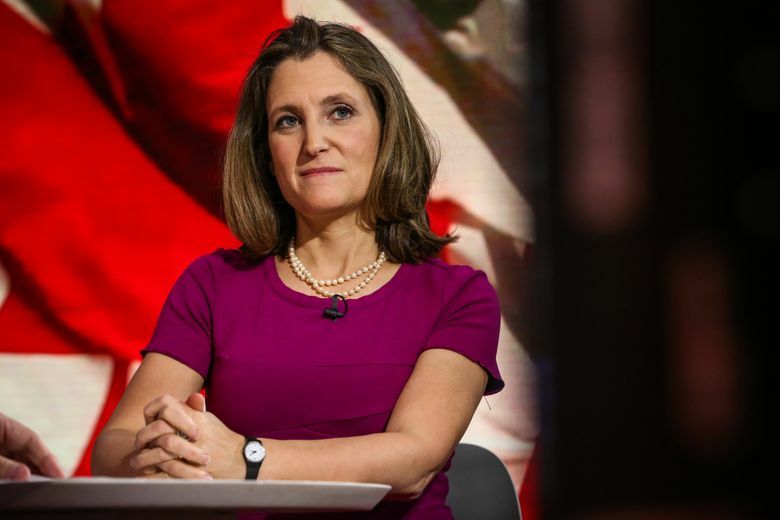 Canada’s strong-willed foreign minister leads trade talks with U.S.
She is many things that would seem to irritate President Donald Trump: a liberal Canadian former journalist. And those who know Chrystia Freeland say she’s unlikely to back down in a confrontation with Trump. That makes Foreign Minister Chrystia Freeland an unusual choice to lead Canada’s negotiations over a new free-trade deal with a surprisingly hostile U.S. administration. Freeland, a globalist negotiating with a U.S. administration that believes in economic nationalism and populism, hopes to salvage a free-trade deal with Canada’s largest trading partner as talks in Washington, D.C., continue. The 50-year-old Harvard graduate and Rhodes scholar speaks five languages and has influential friends around the world. Freeland cut short a trip to Europe after Trump reached a deal with Mexico that excluded Canada. Talks with Canada resumed, but Trump said he wasn’t willing to make any concessions. Younger Murdoch take the reins. How will he deal with Trump? The Trump administration left Canada out of the talks for five weeks not long after the president vowed to make Canada pay after Trudeau said at the G-7 in Quebec he wouldn’t let Canada get pushed around in trade talks. Freeland then poked the U.S. when she received Foreign Policy magazine’s diplomat of the year award in Washington, D.C.
Peter MacKay, a former Canadian foreign minister, said public shaming like that doesn’t work and said some Americans viewed her June speech in Washington, D.C., as something less than diplomatic. Trudeau recruited Freeland to join his Liberal Party while it was the third party in Parliament in 2013. Freeland had a senior position at the Reuters news agency but was ready to move on after setbacks in her journalism career, said Martin Wolf, an influential Financial Times columnist and longtime friend. Freeland, who is of Ukrainian heritage, also wrote a well-received book on Russia, and she left journalism for politics in 2013 when she won a district in Toronto. She has been a frequent critic of Russian President Vladimir Putin, who banned her from traveling to the country in 2014 in retaliation for Western sanctions against Moscow. She remains chummy with journalists, even bringing them frozen treats in 90-degree heat recently while they waited outside the U.S. Trade Representative office in Washington. When Trudeau became prime minister in 2015, he named Freeland to his Cabinet. She served as international-trade minister and worked on ensuring that a free-trade deal with the European Union didn’t unravel. At one point, she left stalled talks after saying it had been impossible to overcome differences. An agreement was reached not long after that, and Freeland received credit.